You can actually see the tail waggin motion in the picture, so you just know Bucky would love to come home with you. 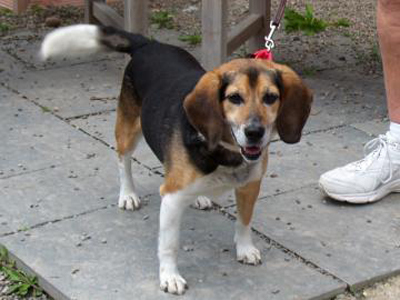 Bucky is a 9-year-old beagle mix who was brought to Lollypop Farm because his family was moving and didn't take him along. He has been an outdoor dog, so he needs an adopter who will care for him with patience and love. He also startles easily and is getting used to walking on a leash. Bucky needs to meet any kids or dogs in the house before going home. He's in our Seniors-for-Seniors program, so adopters age 60 and over can take him home free of charge!